The WEDA 10 comes in a single-phase or three-phase pump type. The single-phase features 1.5 hp, while the three-phase is 1.2 hp. 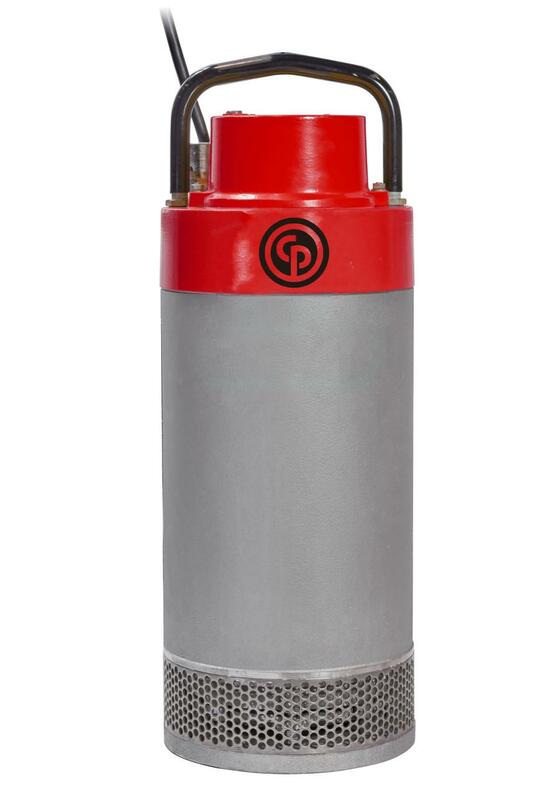 Chicago Pneumatic Power Technique (CP) has introduced five new electric submersible pumps to the North American market. WEDA pumps are ideal for dewatering of construction sites, mines, flooded areas and more where small, lightweight, portable and easily maintained pumps are required to perform daily jobs quickly. Designed for handling liquid with abrasive particles, the five submersible pumps include the WEDA 10, 30, 40, 50+ and 60+. They provide fast and efficient dewatering for a wide variety of applications, including excavations in construction areas, general dewatering requirements at mines, shipyards and other industrial sites, fire brigades, utility installations and repairs, maintenance and cleanup tasks in urban areas, and government and military response and preparedness programs. The WEDA 10 comes in a single-phase or three-phase pump type. The single-phase features 1.5 hp, while the three-phase is 1.2 hp. 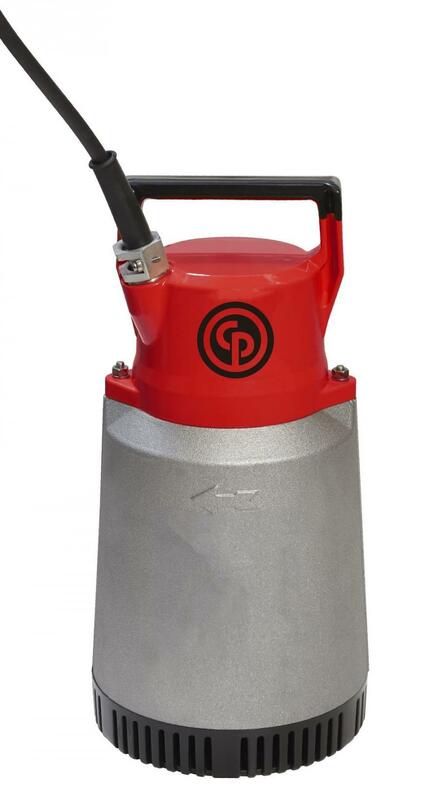 Weighing 27.5 lbs., the pump's dimensions include a circumference of 7.2 in., width of 8.7 in. and length of 17.4 in. Designed for heavy duty pumping of abrasive liquids, the WEDA 10 has a maximum submersible depth of 66 ft. It also allows a maximum flow of 117 gallons per minute (gpm) and a maximum solid handling size of .16 in. The WEDA 30 comes in a single-phase (2.7 hp) or three-phase (2.5 hp) pump type. Weighing 44 lbs., the pump's dimensions include a circumference of 8.7 in., width of 11.2 in. and length of 19.8 in. This pump has a maximum submersible depth of 66 ft., allowing a maximum flow of 370 gpm and a maximum solid handling size of .27 in. The WEDA 40 is a three-phase, four hp pump. Weighing 55 lbs., it has a circumference of 8.7 in., width of 11.3 in. and height of 19.8 in. The submersible depth of the WEDA 40 is 66 ft., allowing a maximum flow of 420 gpm and maximum solid handling size of .27 in. This pump comes in a normal head (NH) or high head (HH) configuration, offering 8.5 hp. Weighing 122 lbs., the pump has a circumference of 10.9 in., width of 13 in. (NH) or 11.9 in. (HH) and height of 28.3 in. At 66 ft. of submersible depth, the WEDA 50+ allows a maximum flow of 620 gpm (NH) or 310 gpm (HH) and maximum solid handling size of .32 in. The pump comes in a normal head, high head or super high head configuration, offering 11.5 hp. Weighing 134 lbs., the pump has a circumference of 10.9 in., width of 13 in. (NH) or 11.9 in. (HH, SH) and length of 29.9 in. At 66 ft. of submersible depth, the WEDA 60+ allows a maximum flow of 700 gpm (NH) or 340 gpm (HH) and 260 gpm (SH). The maximum solid handling size is .32 in. The super high head model is the smallest and lightest in its class. For more information, visit www.cp.com. Since 1901, the Chicago Pneumatic name has represented high-performance tools and equipment designed for an extensive range of applications. Chicago Pneumatic offers a wide range of pneumatic, hydraulic and petrol-driven equipment, portable compressors and generators and light towers. With a global network of distributors, Chicago Pneumatic provides customers with worldwide sales and service support.